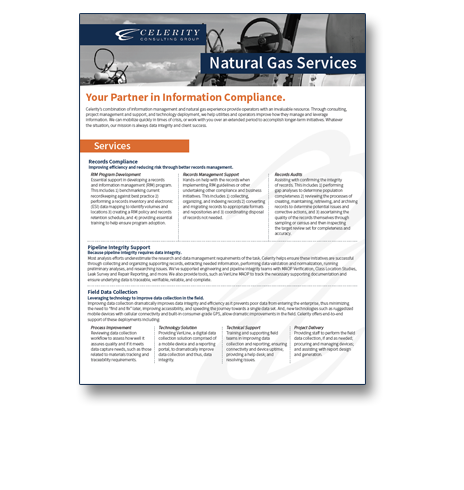 Celerity’s combination of information management and natural gas experience provide operators with an invaluable resource. Through consulting, project management and support, and technology deployment, we help utilities and operators improve how they manage and leverage information. We can mobilize quickly in times of crisis, or work with you over an extended period to accomplish longer-term initiatives. Whatever the situation, our mission is always data integrity and client success. Improving efficiency and reducing risk through better records management and improved records integrity. .
Providing information support for pipeline integrity analyses and initiatives. .
Optimizing field data collection and reporting through process improvement consulting, mobile technology, and project support. .
Offering data preparation, validation, and optimization assistance for migration and integration efforts. . Assisting with the information-intensive requirements of challenging legal and regulatory situations. .
Our suite of services is especially relevant for mission-critical initiatives such as Materials Tracking and Traceability, which require advice on what data is required to support recent and impending rules, corresponding improved approaches to data collection, and the integration of legacy data. A solution that transforms any data collection workflow from paper to electronic for improved compliance, analysis and reporting. Prior projects include leak investigation, regulator traceability and condition assessment, plastic fusion inspection, and damaged markers survey. An MAOP data management application that documents and validates compliance with PHMSA reporting requirements. A solution for managing client and customers in support of environmental mitigation efforts or high-touch programs. A document and workflow management application that helps track regulatory requests and ensure timely and consistent responses. A customizable document review platform to support document coding initiatives or records quality audits. Which product(s) are you interested in previewing? Celerity’s clients include some of the largest utilities in the country. Within these entities, we have helped teams from a wide variety of functions including, engineering, construction, pipeline integrity, compliance and quality, information technology, regulatory, and law.